KILIFI, Kenya (Thomson Reuters Foundation) – A slight breeze makes the afternoon humidity bearable as Kibibi Mramba and 19 others plant tiny mangrove shoots along a creek in the Kenyan coastal town of Kilifi. 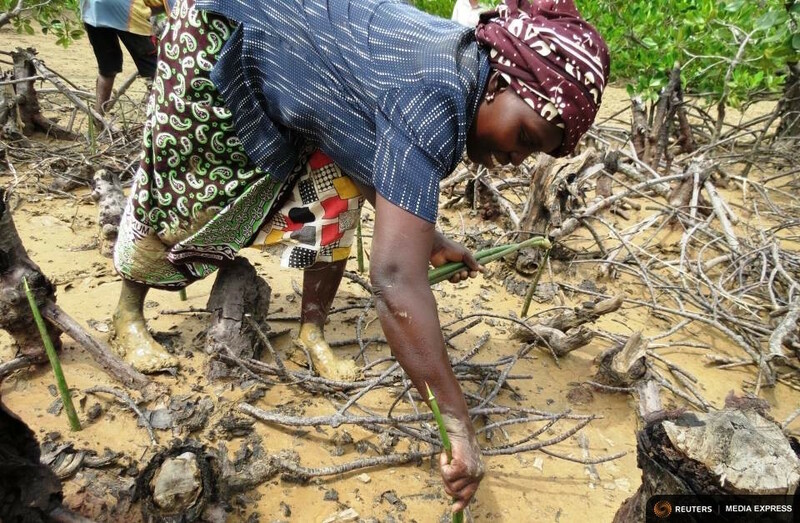 For the past five years, members of the Mtongani Self Help Group have been acting as volunteer forest guards, restoring mangroves along the Kilifi Creek, some 75 km (46.6 miles) from Mombasa, Kenya’s second-largest city. They also maintain four tidal fish ponds nearby, which help them conserve local marine life and make a living as climate change impacts bite and fish catches on the open sea shrink. “I am educating my children from the proceeds I get from planting these mangroves, and selling the prawns and fish we farm,” said Mramba. According to the Kenya Marine and Fisheries Research Institute (KMFRI), coastal mangrove forests are among the world’s most important wetland ecosystems, providing crucial habitat for wildlife and fish, slowing coral reef sedimentation, and protecting coastlines from severe weather events. But they are also being destroyed at an alarming rate. Over the past 50 years, around one-third of the world’s original mangrove forests have been lost to unsustainable wood harvesting, pollution, unfettered development, flooding, erosion and sedimentation, says KMFRI. With aid from Slovakia, channeled through the Kilifi-based Kwetu Training Centre for Sustainable Development, the Mtongani group has replanted more than 15,000 mangrove trees since it formed in 2010. Members also work with the Kenya Forest Service to stop illegal loggers. “The cutting has reduced since [loggers] know now even a woman can arrest them,” said Mramba. According to James Kairu, a principal scientist at KMFRI, the destruction of Kenya’s mangroves is a major factor in the struggles of the country’s fishing communities. Fish breed in mangroves before moving to live in coral reefs. Kairu said over-exploitation of fisheries, the felling of mangroves and rising global temperatures have put pressure on the mangrove and coral ecosystem, harming fish populations. The villagers of Kilifi, who mostly depend on fishing for their income, have seen a drastic drop in fish numbers over the last few years. To combat the problem, the Mtongani group decided two years ago to complement their mangrove restoration project with mariculture, the farming of sea life in salt water. The group built four tidal ponds, each 20 metres (65.62 ft) by 15, which hug the Indian Ocean. Twice a day when the tide comes in, the water brings crabs, fish and prawns that are left behind when the tide goes out again. The group catches the creatures to eat, sell and stock their ponds, which are replenished with new nutrient-rich water at each high tide. “We started this project as an alternative source of food and livelihood after fishing started to become unsustainable,” said Nicholas Ngao, chairman of the Mtongani group, whose name means “a relaxing place by the sea” in Swahili. Every three months, the group harvests about 300 kg of fish, 108 kg of prawns and 70 kg of crab. The members sell their catch for between Ksh 200 ($2) and Ksh 1,000 ($10) per kilo. They also sell at least 12,000 mangrove seedlings every year for up to Ksh 20 each. A tenth of the proceeds goes towards group maintenance, while the rest is divided among members according to their workload. Combining mangrove conservation with tidal ponds could give coastal communities a chance at a sustainable future as they feel the effects of global warming, said KMFRI’s Kairu. A report by leading marine scientists, published in July, warned that if temperatures continue to rise at their current rate, ocean warming will further harm marine life, directly affecting food access in coastal communities such as Kilifi. Higher temperatures can also trigger devastating storms. Kenya’s coast is still recovering from the effects of the El Niño weather phenomenon in 1997-98, which raised ocean temperatures and brought high rainfall. The result was massive sedimentation, killing huge numbers of mangroves and exposing coastal villages to strong waves. The warmer seas also bleached enormous areas of coral reef, putting stress on the region’s fish populations. With another major El Niño event now underway, Mramba, Ngao and the other members of the Mtongani group hope that by finding an alternative to traditional fishing and restoring mangrove forests, they can help their village survive – and maybe even thrive – in the face of climate pressures. Reporting by Sophie Mbugua; editing by Jumana Farouky and Megan Rowling.